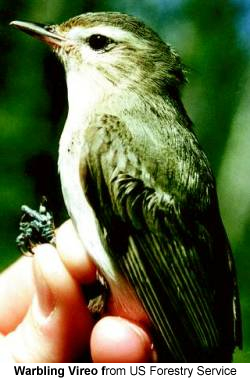 The Warbling Vireo, Vireo gilvus, can be found in open deciduous and mixed woods across most of North America, ranging from Alaska to Mexico. These birds migrate to Mexico and Central America. They build deep cup nests suspended from tree branches or shrub, placed relatively high in the east and lower in the west. Both male and female share in the incubation duties. Diet include insects and berries. Their song is a cheerful warble. There are subtle differences in song between eastern and western birds.